Hi...so sorry my last post was literally the chart for part five of the Victorian SAL and nothing else. I am so busy at the moment it is beyond belief. The floor is finished: the fireplace looks amazing and we have spent the last two days painting the walls...then thanks to an Irish brand of paint which quite frankly was not fit for use (soap box for another day) we then had to spend a day stripping a wall and re-painting it....it looks amazing now though: just need to add the finishing touches. Pictures soon when my poor aching limbs stop, well, aching. My son flew over from the UK today. I haven't seen him since June and I won't get to see him until tomorrow so I can't wait for that! He'll be here for two weeks and then he's flying back to the UK with my daughter who is also going back with him. There are simply no prospects for young people in Ireland and I feel very let down by our government and how it is treating (or not, in this case) our young people but I am really proud of my children for knowing they can do anything they want and for being brave and going out there to find their way. So I am going to be spending the next two weeks being with my complete family, helping my daughter pack and move, and just being thankful for having such amazing children. In two weeks though, I will be a wreck...I'm trying not to dwell on it. And talking of thankful, Thanksgiving is a very important day in our house and I have a lot to be thankful for! I will tell the story on the day but until there here is a free Thanksgiving chart. Enjoy it. If you stitch it I would love to see your finishes! The chart doesn't really reflect the colours of the threads used but they are gorgeous, deep autumnul colours. Just beautiful if I do say so myself! click on the picture and right click to save it to your computer and then print it! Wow it's so sweet too..
Have a wonderful time with the family! Thank you for the lovely design. 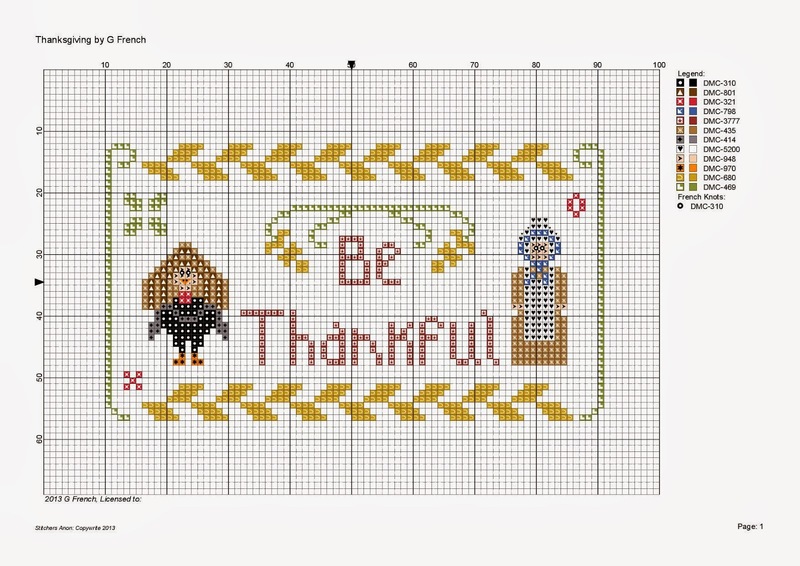 Enjoy your family time ~ and thanks so much for such a sweet chart! Thank you for this beautiful chart! Thank you for popping on and reading my blog. I love to read your comments and if you do comment, it means I can find your blog..one can never follow too many blogs!. Paper and Fabric and Books.....Oh My! All the days of . . .